What do vegans eat is a common question that I get asked a lot. I always say a healthy vegan diet is made up of five groups. Grains like quinoa or brown rice, legumes like lentils and beans, vegetables, fruits, and healthy fats like nuts, seeds, and avocado. Vegans do not eat meat, dairy, eggs or any animal by-products like honey. Not long ago, a vegan diet was a rarity, and it was impossible to find vegan processed foods. That has all changed now because eating a plant-based diet is going mainstream. 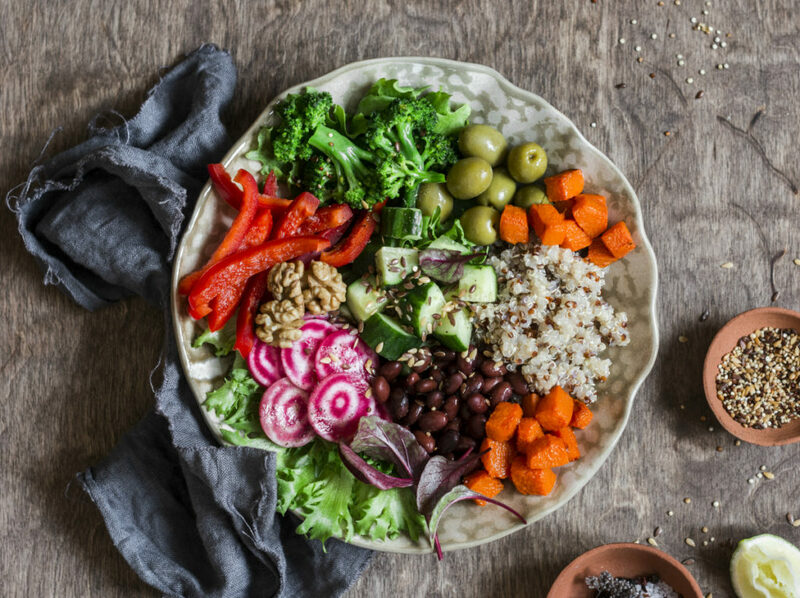 According to a 2017 report, titled Top Trends in Prepared Foods, veganism has grown 500% since 2014. So why are more people choosing a plant-based diet? It could have something to do with the findings published by the World Health Organization in 2015, which linked processed meats such as bacon, sausage and ham to disease. Its report said that 50 grams of processed meat a day which is less than two slices of bacon increased the chance of developing chronic disease by 18%. In May 2017, another study made headline news. BMJ released a startling observational report which concluded that red meat increases the risk of dying from 8 diseases. Another reason could be the environmental consequences of eating red meat. Raising animals for food requires massive amounts of land, food, energy, and water and 50% or more of global greenhouse-gas emission are caused by animal agriculture. Last but not least, younger generations are causing a major shift in the food business because they care where their ingredients come from and how they are produced. They are demanding more humane treatment of animals, accountability and transparency from companies. What ever the reason, it is good news that people are becoming more aware and taking back their health. But getting back to what do vegans eat for a healthy diet is very important because you can be vegan and consume an unhealthy vegan diet. A vast number of companies are jumping on the plant-based band wagon, and it is the fastest growing food movement in the world. But we always have to remember, just because it's vegan doesn’t mean it's healthy. Eating highly processed vegan foods can be downright as harmful as consuming red meat. Many processed vegan foods like vegan cheese contain genetically modified soy. There is a growing list of health problems associated with GMO soy. Processed vegan foods can contain significant amounts of oil. Many vegan cheeses contain palm oil. Palm oil has become one of the world's leading causes of rainforest destruction by palm oil companies. Not to mention that most of the leading plant-based doctors recommend no oil. These processed foods can also contain chemicals like hexane or hydrolyzed protein. So please don’t make vegan processed foods your new diet. Keep it clean and simple and always use the power plate as a reference. Eat grains, legumes, vegetables, fruits and healthy fats like nuts, seeds, and avocado. You can include these ingredients in a soup, or a stir-fry or a simple, beautiful plate of food like the one on top. For more help getting started on a vegan diet, visit my vegan food pyramid. Sign up here to receive all of Ordinary Vegan’s free recipes. 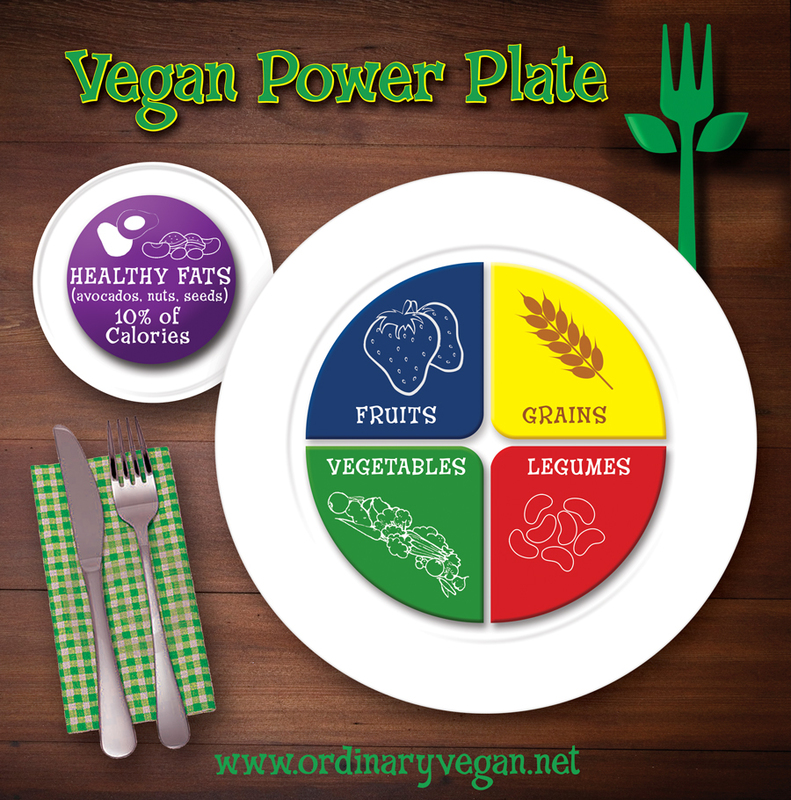 Listen to Ordinary Vegan’s radio show on iTunes or right here on this website . I hope this information helps you live a long and healthy life. A free downloadable vegan protein list is available here. Hi Sonia – congratulations to your husband on his vegan diet. Glad to hear you are also trying a vegan diet. Always remember, you don’t have to be the perfect vegan just do your best. Thanks for stopping by and for being part of our healthy community! Why do you need to follow your husband? I eat a Whole Foods Plant Based diet and my husband eats meat. We don’t let our differences cause a rift between us. They are simply life choices. Great to hear that your different eating styles do not cause a rift. It sure caused a rift in my last relationship! Now I am making sure that the person I am with, if anyone, is open-minded and that helps to solve a lot of issues. I understand and accept a lot of the pro-vegan arguments. I often notice claims regarding unhealthy food choices that can’t be substantiated by objective research. On the health benefits of veganism, followers should balance their view by reading the numerous FTT (failure to thrive) scholarly articles too. The increasing demand for exotic and out of season vegan food ingredients, has caused shortages in the countries of origin, enriching a few. Unless one is a climate change denialist, the carbon footprint of obtaining these foodstuffs from faraway places must be a concern. Is the vegan movement not replacing one type of unethical behaviour with another?